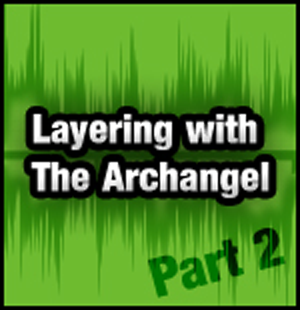 Archangel takes us through using effects in our layered beatbox compositions. So what are effects? This may seem like a fairly silly question. But in reality it addresses the first thing we need to know. You may have heard the terms 'effects processors' and 'dynamics processors'. The first refers to a piece of equipment (hardware or software) that processes an incoming sound, adds an audio effect to it, and outputs a mix of the original and effected audio. The second refers to equipment that processes the dynamic content of an audio signal, eg, it's frequency content (done with an equalizer) or dynamic range (using compressors or limiters). If you want to find out more about compression, read the compression article. Dynamics processors: eq, compression, limiting. Effects processors: Chorus, phaser, delay, reverb etc. How do I use FX effect-ively? Again, this is a very poigniant question which may not necessarily spring to mind. The point is, even though we have many varied fx tools at our disposal, the real art is knowing when too much is too much. Reverb (or reverberation to use it's full name) is the effect of making audio sound like it's in a 'space', be it a concrete stairwell, or the Taj Mahal. The reason a room etc. has reverb is because sound bounces off surfaces. If you go into a squash court and shout, you'll hear it bounce around the space. It keeps going because there isn't just a single bounce. The sound will keep bouncing off opposite surfaces until it's dies away. Novice Jedi at the beginning of their audio lives tend to add far too much reverb to their vocals etc. which washes all of the definiton out of the original sound. The reason reverb is such a useful tool is that it gives your audio some body, which brings it too life. However, another rookie mistake is to use different reverbs on lots of different elements of their track. This sounds horrible to us because the brain can't decipher what size space the track is in. Very messy and best avoided! However, if you have one or two different reverbs, you can put all of the different audio parts into the same 'space', making it more coherent, whilst saving the second reverb for special things like making splash cymbals sound huge and shimmering. Put your reverb plugin on an aux channel, not directly on a track. This allows you to send multiple tracks to the same verb, in different amounts. Set the dry/wet ratio to 100% Wet. This means the verb track will only have the reverb sound. Don't use loads of verb on sounds. It will wash out many of the details and make the mix mushy. Delays are basically the same thing as reverbs. The difference is the amount of time between each 'bounce'. For example, it sounds close and quick if you're in your bedroom and shout ECHO! But if you stand on the edge of the Grand Canyon and shout ECHO, you have to wait for the sound to reach the other side, bounce, and come all the way back to your ears and you hear "echo...echo...echo...". The time it takes to repeat is called the delay time and is a fundamental part of using your delay fx properly. Most delay units now allow you to sync the delay time to the tempo of your track in musical increments (1/8th, 1/16th etc.). This is very useful because if your delays don't work with your tempo, then the track will sound very cluttered and not at all tight. Sync the delay to the song tempo. This will let you make echos that work rhythmically with your track. If your delay plugin doesn't allow you to sync, you can work out the delay speed you want in milliseconds. Try using different times for the left and right channel for interesting delay effects. Chorus and phaser units are essentially the same thing. Just like with reverb vs delay, the difference is an amount of time. A chorus pedal works by taking the incoming signal, copying it, and delaying the second signal before mixing them back together at the output. The second signal is 'out of phase' with the first signal. This is what gives chorus/phasers their wooshy sounds. By adjusting the amount of time difference between the two you can change the sound of the effect. Very useful effects, but watch out with bass. Because chorus/phasers are stereo effects they can really mess with the sonic content of your bass and it may not work well with the other track elements. The solution is to convert any chorus bass into a mono signal after applying the effect. Your imagination is the limit here. Mess with these fx for some incredible audio mangling. Use eq and compression after using these fx to control the dynamics of the sound. This type of effect can produce very transient peaks! Try using these fx on sounds like hi-hats and crash cymbals for an interesting take on percussion. Man. I love a good ol' vocoder. Do you want to sound like a robot? A demonic vacuum salesman from Ipswich? 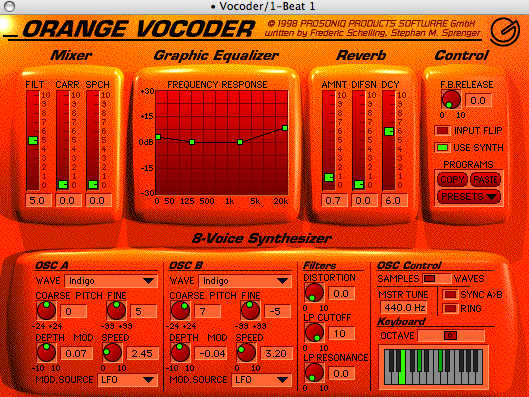 A vocoder is basically a synthesizer that you can put external sounds through. 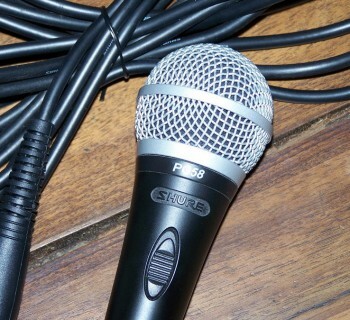 You strap a vocoder on the channel you are recording to, and that's it! Bbox or sing through one of those badboys and tweak the settings. You'll melt your own brain! There are many and varied types of effects on the market. And a gazillion free ones available for download. go out and buy a copy of Computer Music magazine. It comes with a DVD every month that is packed with free effects plugins and only costs about £6. So, you have a few hints and tricks to work with now. With just the above effects, you can utterly transform your sounds. The great thing about fx is that they work in real-time. That means they can process the audio as you do it. There's no need to wait until you've done the recording to slap a chorus on it. Set up fx until you have a sound you like, then beatbox through it as you record. The recording will be clean, but you'll hear the effected sound!